Exceedingly silly, Central Intelligence survives a rough start to achieve at least one of its evident goals, namely, to be a lowbrow comedy for audiences with low expectations. 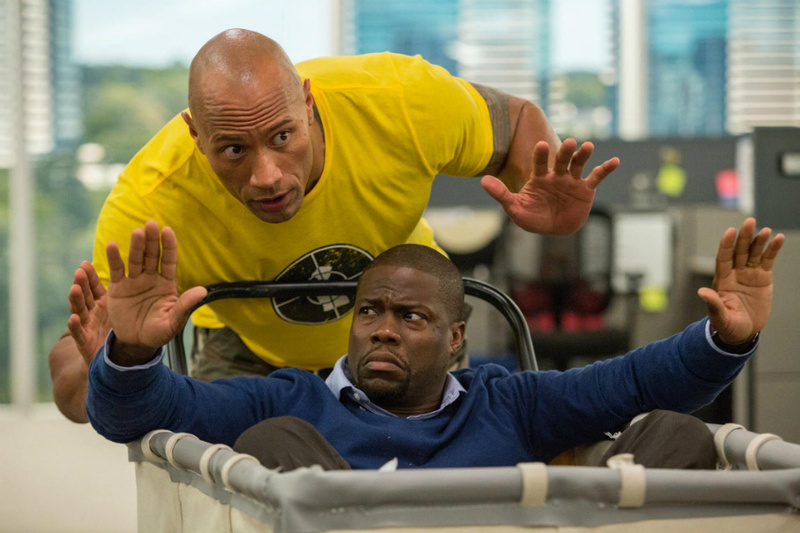 Dwayne Johnson and Kevin Hart star as an updated pair of 1980's 'buddy cops.' As a prologue set in 1996 reveals, the two were high school classmates with wildly different profiles. Calvin Joyner (Hart) was everyone's favorite, beloved by fellow students as well as teachers, an exemplary athlete, a good student, and a good boyfriend to the equally popular, studious, and good-looking Maggie (Danielle Nicolet). Meanwhile, Robbie Weirdick (Johnson) was picked on by everyone, a big kid carrying a lot of extra weight and the near-unanimous object of ridicule when bullies toss him naked into the packed school gym on a night when Calvin is being honored. Calvin, however, displays empathy for Robbie and kindly offers him his beloved letter jacket to cover up. Twenty years later, Calvin and Maggie are happily married, but the prospect of attending their upcoming high school reunion is making Calvin seriously discontent. He toils away as a forensic accountant for a faceless corporation in an anonymous building. His wife has become a partner at a law firm, and Calvin yearns for that type of success; as he tells her, she's good at her job and loves it, but he's only good at his job. He wants a job -- and career -- that he can love. And what do you know? Just when Calvin is feeling darkest and has accepted Maggie's proposal that they seek marital counseling, Calvin receives a Facebook invitation from "Bob Stone." Not really knowing who it is, he accepts and soon his life is turned upside down. "Bob Stone" turns out to be a very different looking Robbie Weirdick, whose current line of work allows the film to blossom into an action comedy that rarely takes itself seriously. Initially, the screenplay, credited to Ike Barinholtz, David Stassen, and director Rawson Marshall Thurber, leans heavily on crude, borderline offensive humor. Once "Bob Stone" shows up, however, the dirtier humor is downplayed in favor of broad comic strokes, many of them supplied by Dwayne Johnson. Johnson has always threatened to wink at the audience. A former football player, he began his entertainment career as a professional wrestler and thus he knows how to play to a crowd. That has sometimes made it hard to take him seriously as a dramatic actor, though he's improved in that regard over the years, but when allowed to embrace his buoyant public persona and comic instincts on screen, he's an absolute pleasure to watch. For his part, Hart benefits by having Johnson as a foil. Johnson is easily a foot (or, 0.3 meters) taller than Hart, and their physical differences are fully exploited for comic effect. Hart is quicker with a wisecrack, but never reduces Johnson to a pure straight man; Johnson has plenty of opportunities to provoke laughter all on his own. In return, Hart is rarely amped up to resemble a phony action star; he's an ordinary man who really, really, doesn't want anyone to think that he's friends with someone like the armed and dangerous fugitive "Bob Stone." Neither Johnson nor Hart will be mistaken for great dramatic actors in the film, but then, that's not what's required. Danielle Nicolet does nicely with her role as a supportive wife, and it's always a pleasure to see Amy Ryan -- here she plays an FBI official tasked with bringing "Bob Stone" to justice and is more than effective as, I suppose, a feminine "straight guy." I've not seen director Thurber's previous films, which include Dodgeball: A True Underdog Story, The Mysteries of Pittsburgh, and We're the Millers. On the basis of this film, however, I'm curious to see more of his work. He has a good understanding of how to choreograph comedy. That being said, it should be noted that his action sequences are almost entirely rubbish. The emphasis is on the comedy, though. 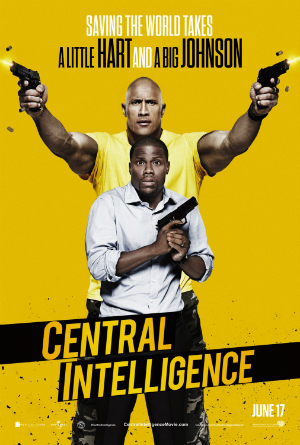 Central Intelligence is so silly that it's impossible to take it seriously. Its style of humor makes a welcome shift from an emphasis on bawdy jokes to something closer to character-based comedy. Harboring no ill will toward anyone except bullies, this entirely average movie becomes much more likable as it plays. I found myself laughing along, fully embracing my own lowbrow instincts. The film opens wide in North American theaters on Friday, June 17. It also opens under a variety of titles in many other territories around the world this weekend. (In Spain, for example, it's known as Un espía y medio, or A Spy and a Half).